Having released their album Full Throttle this year in Europe which has to be one of the best rock albums in 2014, Massive have made their way to the UK and are on tour with The Treatment. Having crossed the country, tonight it was the turn of London to witness this deadly 8-legged Aussie rock monster at their very best. Starting from the very first note Massive were full of huge riffs, thumping bass, powerful rock vocals and pounding drums from Brad Marr (Vocals, Guitar), Ben Laguda (Lead Guitar), Aidan McGarrigle (Bass) and Jarrod Medwin (Drums). 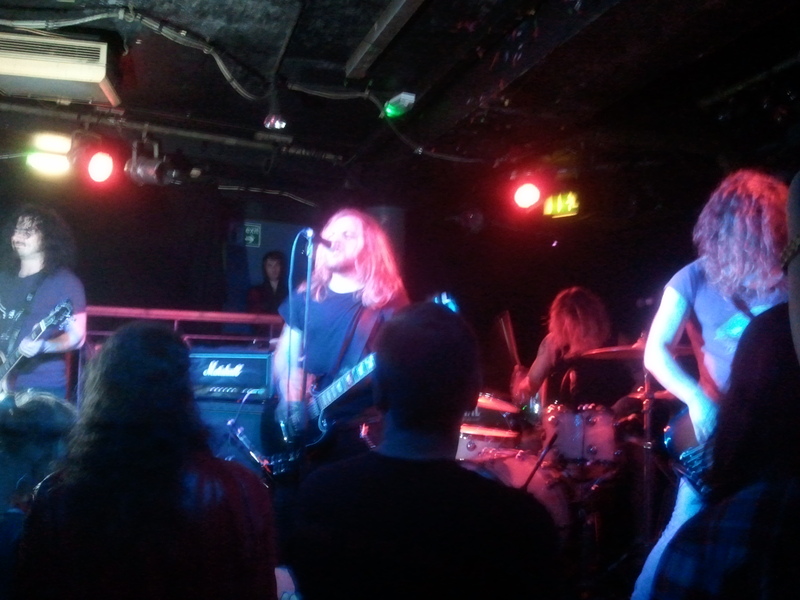 Straight into ‘Burn The Sun’ it was crashing guitars from the outset, enormous riffs backing the fast paced rhythm section. Instantly Massive had grabbed the attention of everyone in the venue and with the epic vocals resounding out across the crowd, you knew you were seeing something special. Next it was ‘Hollywood’ which has been a bit prophetic for Massive on their UK tour as their tour van had decided to die in Hollywood (the Birmingham one) and they had to be towed to Wales the previous day. With the drums thumping throughout the track, it was only the second song in and the band were showing us Brits how rock should be done. If you have already heard the album then the live version is every bit as good and with the volume turned up it just sounds awesome. ‘Lacey’ was a full on power track, the vocals of Brad soaring over the rest of the band. If anyone at that stage wasn’t impressed at how great they were sounding during their set then this was the song to drag them from the bar. A full on stomping song, there was no easing up on the pace as Massive rocked the venue. ‘Dancefloor’ with its killer riffs and enormous bass pouring out the speakers was even more epic live. A particular favourite of mine due to it being such a huge rock song with its addictive hooks throughout, this song was proof that tonight Massive owned the not just the dancefloor but the whole venue. No one could have possibly stood still whilst the band put in such an energetic performance. ‘Ghost’ with its swirling guitars toned down the pace only slightly as the gritty guitars still sound huge on this track, with the vocals rising to a monster crescendo at the end to cheers from the crowd. The opening track from the album ‘One By One’ was next, the anthemic sound all coming together to include an outstanding guitar solo, Massive were still not done with giving their set the full on rock treatment to the delight of the crowd. With the final song ‘Now Or Never’ bringing to a close one of the most awesome sets I have seen in all the years of going to gigs, this song with its epic full on rock, massive guitar riffs and an enormous rhythm throughout was the perfect end to their set. If anyone in the crowd tonight had never heard of Massive then there can be no doubt that every person that was there encountered rock at it is very best and they certainly gained a lot more fans based on their performance tonight. With a live rock set this awesome, Massive proved tonight that they are the best rock band to come out of Australia in recent years.